If you read my last blog about an attitude adjustment, you may have noticed some things that need changing. It occurred to me that I left you hanging… So, let’s say we need some adjusting, how do we go about it? First, repent. Ask God, and anyone else who may have been a witness to your bad attitude, to forgive you. That is always the first step to change. Next, you have to choose to change the way you think and speak. Before church, thank God for your Church Family, your Pastors, leaders and those who serve. Be honored and thankful that you get to serve yourself, (if you aren’t ask if you can, volunteer.) Ask God to help you serve with His Joy. Choose to go to church because you love Him and look at your service as an extension of that love instead of a duty or obligation. We also need to change the way we look at others. When a negative thought comes in, before you blurt it out, cast it down and replace it with something positive. It may be hard at first, but even if all you can think of is “they have nice shoes”, then so be it. It’s a start. Never despise small beginnings. At work, be thankful for a job! Choose to see your employer as a vessel that God chose to use to bless you financially. Remember, your boss didn’t start that business to provide for you- he started it to provide for himself and his family. He has just accepted your request to work in exchange for an agreed upon amount of money. You can’t get mad because he drives a jag and you a pinto. He has all the headaches that come with owning a business and the responsibility. He also made all the investments to get the business up and running. Respect and honor your bosses and supervisors at work. Refuse to participate in the grumbling and complaining. Pray for those in authority over you. Not a “change them” prayer but a “change me” prayer. When you adjust your attitude, with God’s help, you will see great changes. You will have more joy, have more patience, less worry and stress. You will love people more, hear God clearer and you will definitely be more fun to be around! 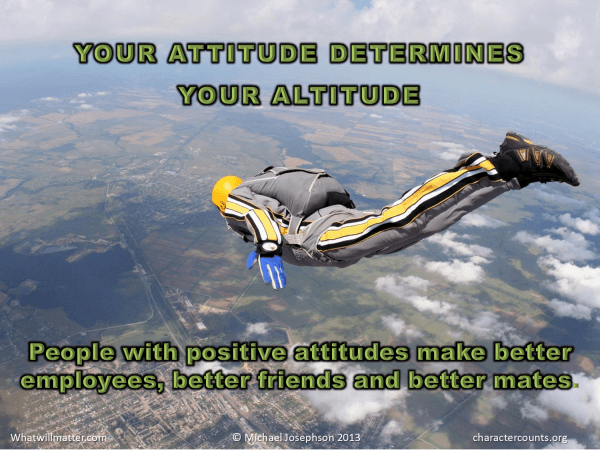 This entry was posted in Thoughts and tagged attitude, boss, change, changing your attitude, Christ, Christianity, Church, employee, employer, family, God, good thoughts, help, honor, hope, Jesus, Lord, love, negative thoughts, Respect.